If your child is coughing, sneezing and has a runny nose for several weeks, but doesn't have a fever and otherwise seems well, does he just have a cold or could it be allergies? If you're more likely to think allergies in the spring and a cold during those back to school months, you might be wrong. Although most people think of spring as the allergy season, depending on what your child's allergic to, autumn can be just as bad. It's important to tell the difference between a cold and allergies because the treatment for these conditions is not the same. Here are some important clues to help you tell if those symptoms indicate a cold virus or allergies. A runny nose is a common symptom of both a cold and allergies. Although a​ runny nose from a cold will start off being clear, it often turns yellow or green after 3 to 5 days. Children with allergies will continue to have just a clear runny nose. 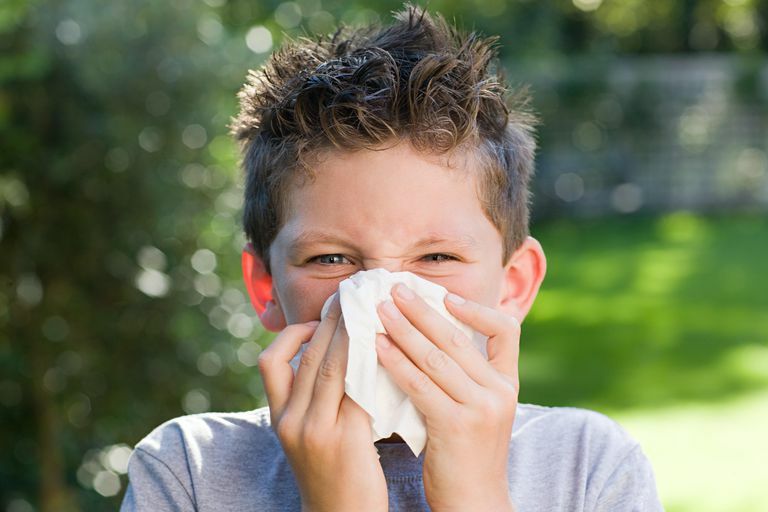 If your child's symptoms change with the weather, it's probably allergies. For example, ragweed counts usually decrease after heavy rain, so if your child's symptoms improve after it rains, he might be allergic to ragweed. Or if his symptoms are worse on days that are windy, that might also indicate an allergy since pollen counts are often higher on windy days. When your child catches a cold, other family members usually get sick too. If no one else at home has caught it, that is a good sign the "illness" might be allergies. However, other family members might have similar symptoms because they are allergic to the same things. Children with allergies will often have dark circles under their eyes, called allergic shiners. They might also have a small crease near the bottom of their nose (nasal crease) from pushing their nose up because it is itchy. Inside their nose, the mucosa will often be pale and swollen, while it is usually red and inflamed when you have a cold. Since the pollen count peaks in the late morning and early afternoon (10 a.m. to 4 p.m.), keep your child indoors at this time. Keep the windows of your house and car closed to minimize your child's exposure to allergens (things he is allergic to), check pollen counts, and don't let your child outside when people are mowing their lawns. Allergy testing might also help if you aren't sure what is triggering your child's allergy symptoms. If the test reveals an allergy to ragweed, then you won't be surprised when he begins getting allergy symptoms when the ragweed counts are high.